Posted on 22, July 2016 by EuropaWire PR Editors | This entry was posted in Education, Science, United Kingdom and tagged dark matter experiment, dark matter particle, Dr Cham Ghag, Dr Jim Dobson, Lux, Sally Shaw, The Large Underground Xenon, University College London. Bookmark the permalink. LONDON, 22-Jul-2016 — /EuropaWire/ — The Large Underground Xenon (LUX) dark matter experiment has yielded no trace of a dark matter particle after completing its final 20-month long search of the universe, according to LUX collaboration scientists including UCL researchers. LUX’s sensitivity far exceeded the goals for the project and the team are confident that if dark matter particles had interacted with the LUX’s Xenon target, the detector would almost certainly have seen it. This finding enables scientists to confidently eliminate many potential models for dark matter particles, offering critical guidance for the next generation of experiments. “The discovery of the nature of the elusive dark matter that accounts for more than four-fifths of the mass of the universe is internationally recognised as one of the highest priorities in science, and the LUX experiment is the world-leading experiment in the direct search of it,” explained UCL LUX collaboration scientist Dr Cham Ghag (UCL Physics & Astronomy). Scientists are confident that dark matter exists because the effects of its gravity can be seen in the rotation of galaxies and in the way light bends as it travels through the universe, but experiments have yet to make direct contact with a particle. UCL researchers played a significant role in the LUX experiment since 2012 by performing key data analyses, as well as being part of the maintenance and calibrations effort on-site at the Sanford Underground Research Facility a mile beneath rock in in the Black Hills of South Dakota. The LUX experiment was designed to look for weakly interacting massive particles, or WIMPs – the leading theoretical candidate for a dark matter particle. If the WIMP idea is correct, billions of these particles pass through your hand every second, and also through the Earth and everything on it. But because WIMPs interact so weakly with ordinary matter, this ghostly traverse goes entirely unnoticed. “We’ve worked on identifying and classifying pulses in the raw data collected by LUX to select candidate pulse signal events which could indicate weakly interacting massive particles, or WIMPs,” said collaborator UCL PhD student, Sally Shaw (UCL High Energy Physics). Over the next few months, LUX scientists will continue to analyse the crucial data that LUX was able to provide, in hope of helping future experiments that finally pin down a dark matter particle. 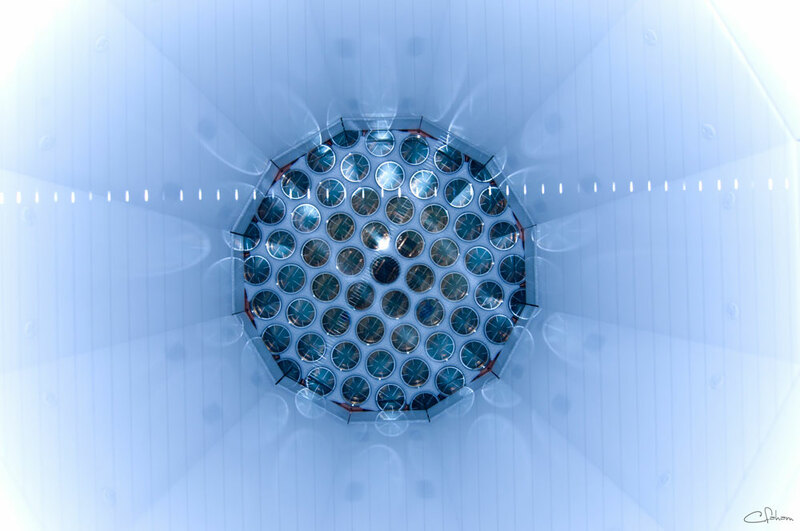 To continue the hunt for a dark matter particle, the UCL team is now working on the LUX-ZEPLIN (LZ) experiment that will succeed LUX and is presently under construction. LZ will be over 70 times more sensitive than LUX. The LUX scientific collaboration is supported by the US Department of Energy and National Science Foundation and includes 20 research universities and national laboratories in the United States, the United Kingdom, and Portugal.